Based on one of the most popular pistols of all time, this Glock 19 airsoft replica is sure to become a trusted sidearm among airsoft skirmishers or a tactical trainers who want to cut ammo costs at target practice. 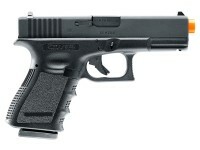 Designed in 1988 as a compact version of the Glock 17, the Glock 19 has become a go-to gun among concealed carry holders. With a design adapted for airsoft, this Glock holds 19 rounds and launches its BBs at 290 fps every time you pull the trigger. It’s responsive blowback feature only adds to the realism this replica offers. Each of these Glock 19 pistols features officially licensed Glock markings across its metal slide, interchangeable modular grips, and the distinctive Glock safety trigger. Use this replica to hone your range skills or clear rooms in close-quarter airsoft combat! You’ve waited a long time for the Glock and Umarex has delivered! 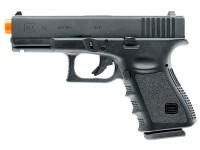 Things I liked: 1 to 1 exact replica of my real G19. Everything works like the real one. Things I would have changed: Nothing physical but the price is a little steep. What others should know: This gun is excellent. 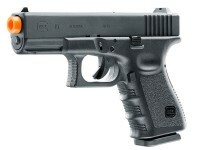 I bought it mainly to train with so that I dont have to spend as much on ammo for my real G19. But Im also going to be playing airsoft with it. Its so realistic. You wont be disappointed if you buy this. Things I liked: Its a great gun. Works well and shoots very accurately. Looks and feels just like the real steel. It is great for practicing for the real thing. Things I would have changed: It is a bit pricey. It would be great if it where a bit cheaper. Things I liked: Glock trades are well printed. Nice trigger. Things I would have changed: Price, price, and price. I own several Umarex pistols and revolvers. I am able to own them because Umarex markets a "good" product at a "great" price. For $170 what you should be getting is a "high end" airsoft pistol in terms of quality. For me it just wasn't there. It went back the same day it arrived. I sold my WE 19 to buy this, and boy am I sorry I did. So much so I purchased a new WE 19 along with an upgraded RA Tech CNC steel outer barrel, and stioll paid $50 less. In my opinion you can't compare the two. The WE looks, feels, and functions exactly like the real steel firearm. Basically you are paying Umarex an extra $50 so they can recoup what they paid Glock for the trades... and not much else. What others should know: The pistol arrived drenched in oil, (I have heard others complain about this). The rear sight was loose. The finish on the slide is a satin black enamel, and unrealistic. The recoil spring felt spungey and weak. The magazine felt much the same way, without the positive click you should hear and feel when inserted. Rated it "good" in terms of accuracy as a "benefit of the doubt" vote because I never fired it. After wiping it down I placed it back in the plastic bag and sent it back to Pyramid Air. PA was great. No hassle at all with RMA or refund. Where did you buy the WE G19?....I can't seem to find them for sale. Does this have removable sights? No it has fixed sights. Does this tgis model have the white painted wall "Officially Licensed by Glock" across one side or were the ewrly concept images I've seen not refelctive of the final product? More importantly, is it built better than VFC brand unofficial models from before the official release?